“Welcome to the estate,” greets Magnus Olovson, general manager at The Sanchaya. 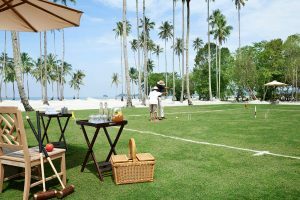 I had just cruised into The Sanchaya’s sprawling 25-acre compound, primed and pampered from another resort on this tropical locale, Bintan Island. Still, I am slightly taken aback when Magnus says “estate”, but that surprise immediately dissipates as I am taken on a brief tour. There is The Dining Room, where a typical morning could start with a healthy shot of jamu to cleanse the palate, before a breakfast of eggs on crab meat and yuzu hollandaise, topped with black caviar. 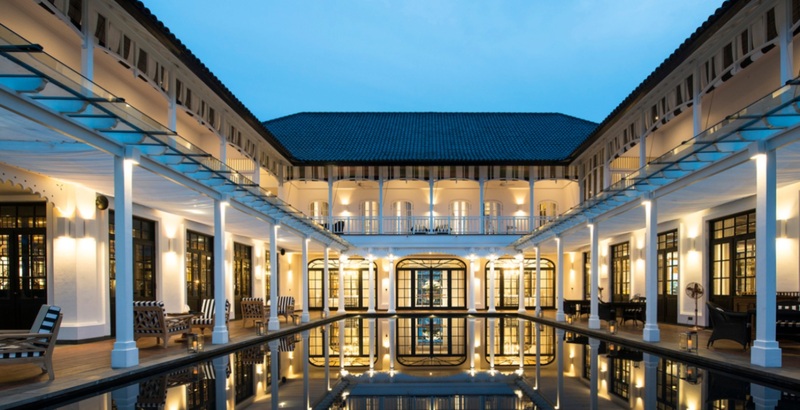 A few steps away, The Bar, with its plush leather sofas, artful gentleman’s-club-like furnishings, and island-friendly cocktails welcome weary travellers. Then, there is The Library, where floor-to-ceiling shelves house tomes, epics, and coffee-table books hand-selected by the founder, Natalya Pavchinskaya, who is a patron of the arts herself. In an adjacent room, The Decanter, a well-stocked wine cellar hosts intimate dinners or sessions with a sommelier to discover perfect pairings and award-winning finds. 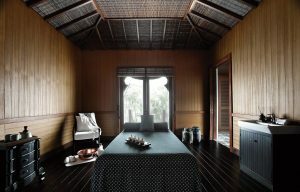 The best-kept secret here at The Sanchaya, though, is the spa. The Sesame and Honey Body Scrub provided the rejuvenating afternoon bliss one might need after a couple of hours of travel. A taster, before my Sanchaya Signature experience the next day. 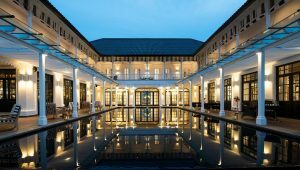 Treatments here begin with a ritual of chakra oil selection, where the chosen one is mixed into the impending treatment to make a more personalised wholesome experience. Root chakra oil of rose and sandalwood on the first day during my Sesame and Honey Body Scrub helped ease my body into my new surroundings, while the heart chakra oil of vanilla and cassia incorporated into my Sanchaya Signature the next day is a soothing mix for the mind, body, and soul. A foot cleansing bath starts each session, where Epsom salt kick-starts the detoxification process, followed by a ylang ylang and green tea salt scrub, leaving my lower legs the smoothest and softest they have been in the longest time. Seasoned Indonesian techniques of careful kneading movements and empathetic strokes are employed alongside Javanese volcanic stones in the Sanchaya Signature to melt away tension in the body—a conscious design by Ria Cantle, the resort’s spa manager, whose love for reiki and crystal healing, as well as deep tissue massages, is heavily imbued in the spa offerings to promote her idea of deep relaxation. And relax, I did, as I start my mornings with yoga in a pavilion right by the spa, the balmy morning breeze ruffling my hair as I settle into meditative poses. During the day, in between meals and spa appointments, I explore the clear waters of Lagoi Bay on a paddle board with a local instructor, who calms my nerves for the beauty living within—fishes, corals, and all. The roads beyond The Sanchaya are as tranquil, as I hop on a single-speed bike and take the 7.2km route around a peaceful lake come sunset … the real world seemingly far away. 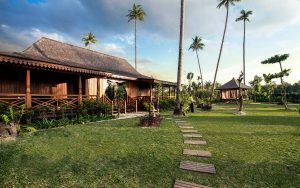 Jalan Gurindam Duabelas, Plot 5, Lagoi Bay, Sebong Lagoi, Bintan Island, Indonesia. A celebrity make-up artist explains the easiest way to achieve a luminous glow. From Emily Ratajkowski to Christy Turlington, here’s who attended the fashion designer’s nuptials.